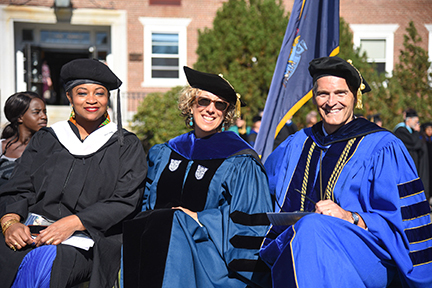 More than 1,000 people -- including faculty in their regalia, accompanying more than 100 of their selected student scholars -- gathered on the green at University of Southern Maine's Portland Campus on Sept. 29 to begin a year-long discussion of race and participatory democracy. USM President Glenn Cummings called 2017 Gloria Duclos Convocation "a great convening." "The USM of today gladly takes on its role as important, relevant and courageous," Cummings said. "We are the university that will not shy away from any topic that makes this country greater and adds to a dialogue that we all desire." For the ceremony's two hours -- in the only large-scale, outdoor event on the campus in memory -- people spoke about race as something to both understand and respond to. Keynote speaker Dòwòti Désir of the United Nations referenced the Trump Administration, the season's devastating hurricanes and how democracy may be changing. "Usually fear, vulnerability and a looming sense of physical and economic danger lead to the shirking of democracy," said Désir, who leads the NGO Committee for the Elimination of Racism, Afrophobia and Colorism located at the United Nations. "Over the course of the year, your activism must confront what is informing the sensibilities of your colleagues." In the end, racism erodes democracy, she said. "Racism, racial discrimination, xenophobia, castes and other forms of intolerance undermine the practice of democracy," she said. 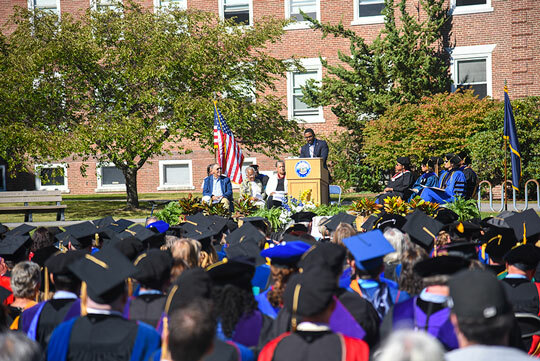 Désir was preceded by the convocation's faculty organizers, Honors Program Director Rebecca Nisetich and Leroy Rowe, an assistant professor of African American History and Politics. "From time to time, our democracy requires fixing," Rowe said. "We each have a responsibility to fix what's broken, to shape and transform our democratic institutions and processes." "Let us fix democracy together." he said. A succession of four students also spoke out. Student Mariana Angelo talked about her own experiences with racism and led the crowd to chant, "It is our duty to fight for our freedom/ It is our duty to win." Student Omar Andrews said people needed to join together to in order to make changes. "It is our voice, our collective voice, that is going to have the greatest effect on each other," he said. Student Joe Menard talked about fostering a community of accountability. "Let us take a step back to create opportunity where we have created barriers," he said. PJ (Pamela Jean) Keehn talked about racism and false promises against Native Americans. "We live in a country that is trying to put terms and conditions on what it means to be free," she said. "This is a time in our country when minorities need to be proactive. The time for change is now." During the ceremony, among the event's speeches, the USM School of Music's ensembles added a powerful message with their music. The Concert Band, conducted by Trae Blanco, played several pieces, including the processional and recessional, and an "Elegy for a Young American" by Ronald Lo Presti. 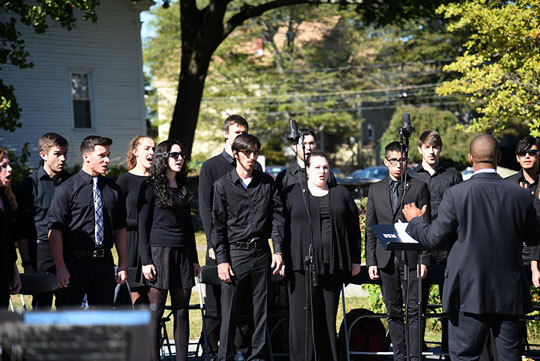 The Chamber Singers, led by Nicolas Dosman, sang "Witness," an arrangement of the African-American spiritual with a message about injustices. 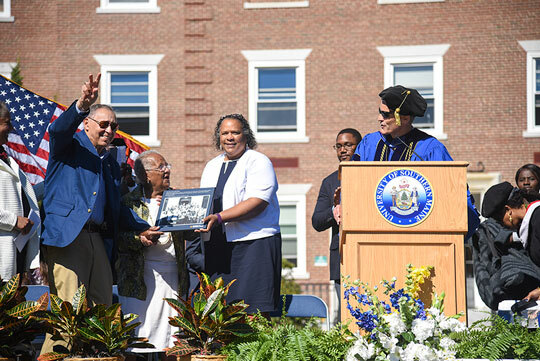 President Cummings also honored Maine civil rights leaders Gerald and Anita Talbot with a plaque and a promise of an annual lecture in their honor. Gerald Talbot was the first African-American member of the Maine House of Representatives and for many years led the Maine Chapter of the NAACP. Anita Talbot was Maine's first African American woman to attend a national political convention. President Cummings called them both "heroes." "Gerry and Anita, from the bottom of our hearts, we thank you for what you have done for our university, our community and our state," he said. The Talbots acted and made a difference, President Cummings said. It's something that is too often lost by people who gather knowledge and data. "Only our souls and our hearts change our world," President Cummings said. "Our actions are everything. History tells us that you can't think your way into right action, but you can act your way into right thinking.